Gay Men To That!! : Michele Bachmann's Iowa State Chair Quits, Endorses...Ron Paul! Michele Bachmann's Iowa State Chair Quits, Endorses...Ron Paul! Ooh, Michele! That's gotta sting! This has been a very good week for Ron Paul! He is still riding high in Iowa polls, he's getting all this free press for his wonderful newsletters, and a glowing endorsement from this Christ-like figure! Now he gets Michele Bachmann's Iowa state chair on his side. Presidential candidate Michele Bachmann’s Iowa campaign co-chairman Kent Sorenson tonight endorsed Ron Paul, one of her rivals in the Iowa caucus race. Sorenson, a state senator from Indianola, announced the surprise endorsement from the stage of a Paul event at the the Iowa State Fairgrounds. The turnabout is a major surprise with just six days remaining before Iowa’s first-in-the-nation caucuses. Sorenson, in fact, appeared at a Bachmann event just this afternoon — a stop at the Pizza Ranch in his hometown of Indianola. Sorenson said little at the event, but appeared with Bachmann and clearly offered indications of support for her candidacy. 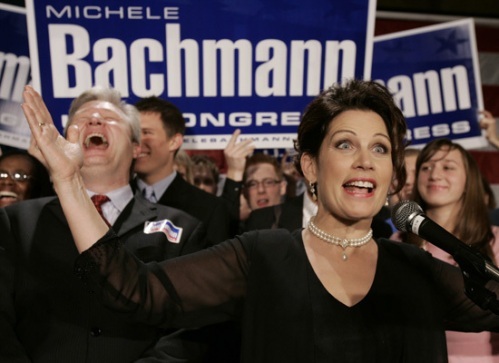 Fellow Bachmann campaign co-chairman Brad Zaun told reporters Sorenson had just returned from the dentist, and Sorenson himself said he was saying little because he was still numb and afraid he would drool on himself. At least she can take comfort in the arms of her manly man husband Marchus. Ooh Michele! That's gotta sting! !